Rototurret is one of those cards that you don't want to include but you want the Runner to fear. The impact of its merece existence is huge, since it prevents facechecking as long as the Runner has at least one program on the table, ends the run if that happens, and can be found anywhere thanks to its extremely low influence cost. But it's weak as far as taxing goes and highly suceptible to Parasite. The best argument in its favour is that it will give you at least one hit per tournament, and that one hit justifies the inclusion of one copy of it. Multiples don't provide any tangible benefit but one is powerful enough to give it a try. The best argument against it is that players will expect it and that one hit per tournament is not worth dedicating it a slot unless you want to force out a breaker, specially since Runners will have to fear Rototurret even if you don't play it yourself. Personally, I tend to include it from time to time to keep Runners guessing or when a two-credit tax and forcing out a breaker is important, like in NBN Fast Advance decks. Here in 2017, three years after its last review, Rototurret might as well be a green card. 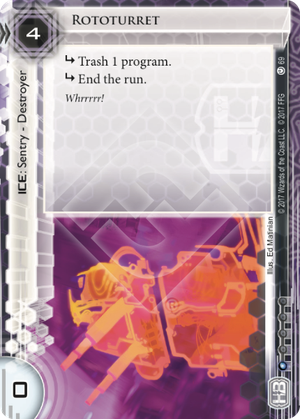 Putting this into a Skorpios Defense Systems: Persuasive Power deck is inherently synergistic: not only a relatively cheap ETR gearcheck, but one that immediately sends the runner panicking for alternatives to the icebreaker they just lost. As the new Weyland ID works right around the ubiquity of heap recursion, it changes Rototurret from a temporary low-strength inconvenience to a potential game-ending threat right off the bat.